When a restaurant excels and distinguishes itself amongst all others, it certainly deserves an update. It is certainly the case for Cugini's, which I previously reviewed and strongly recommended as the only Italian restaurant in Singapore where I would spend my dollars for the best pasta I can have on this island. I went back there to check out some of their new dishes, as their menu has been enriches with numerous appetising gems. I started with a fish carpaccio, which they served with 2 types of raw fish (tuna and yellow tail). This is creativity at its best. I haven't eaten such a fish carpaccio anywhere else before. 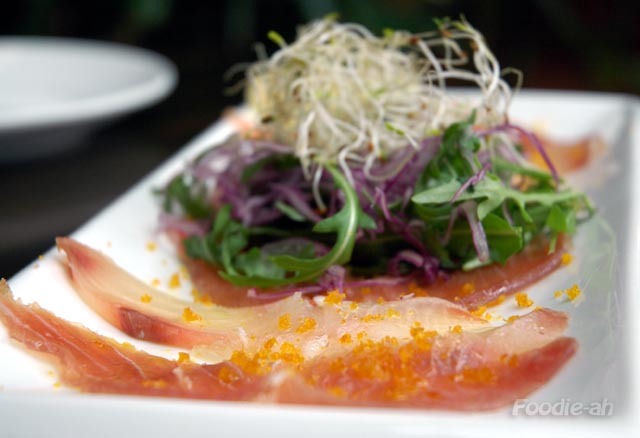 The raw fish slices are cured with a gentle balance of spices that enhances their freshness and texture. What they have created here is an unique dish you can't have anywhere else in Singapore. 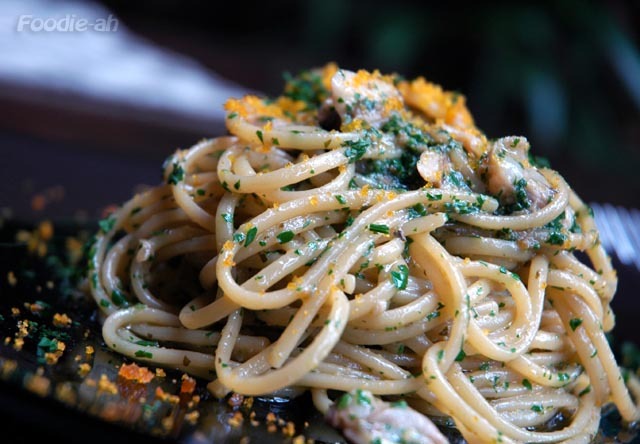 The dusted bottarga on top adds an extra layer of flavour to this already perfect combination. I am usually not a huge fan of seafood pasta with tomato sauces. I generally prefer to enjoy the subtle flavour of seafood with the classic oil based sauce. This spaghetti ai frutti di mare is a Sicilian classic and it is not on the menu (but you can request it as a special). They persuaded me to try it, and thankfully I did! The two outstanding characteristics that hit me as I had the first mouthful of pasta were the intense taste of the sea infused into the sauce and the creaminess of it. The richness is achieved without the use of butter, as other restaurants do. The sauce is enriched with pieces of yellow tail, baby squids, clams, prawns... these flavours all come together and they are distinct at the same time! 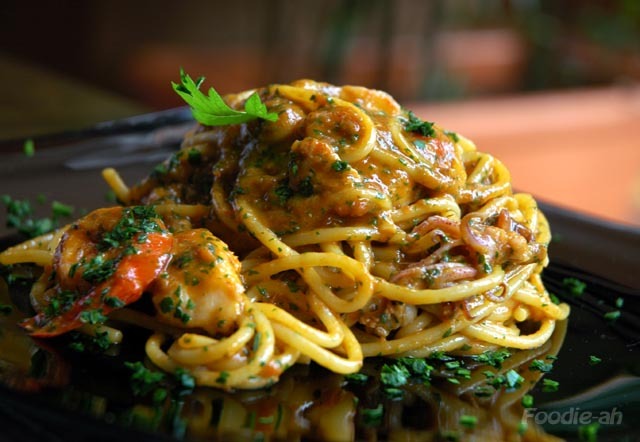 The classic spaghetti alle vongole is a typical dish that you can find in most Italian restaurants. Cugini's recipe takes this dish to a different level altogether. First of all, the clams are shelled so you can enjoy their tender juiciness in combination with the pasta without having to get your hands dirty. But more noticeably, the unique combination of oils and parsley bring the flavours together, making this a memorable pasta. Once again, this dish is not on the menu, but you know what to ask for! I am still thinking of this pasta, I will be back to Cugini's tomorrow. It's touching. It's an addiction.